Stars are blowing themselves to smithereens more often than usual in galaxy NGC 1316. Astronomers have stumbled across two supernovae letting loose there just months apart, in addition to two previous mega-blasts in the past 26 years. That makes the rate of exploding stars in NGC 1316 many times higher than any other known galaxy. The NASA Swift satellite observatory detected the recent twin supernovae on 19 June and 5 November of this year. 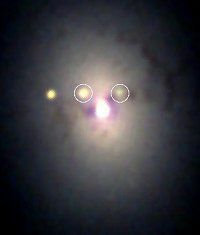 In the images, the supernovae are visible on either side of the bright galaxy centre. "It is actually very puzzling," says Professor Neil Gehrels, a Swift investigator at NASA's Goddard Space Flight Center.